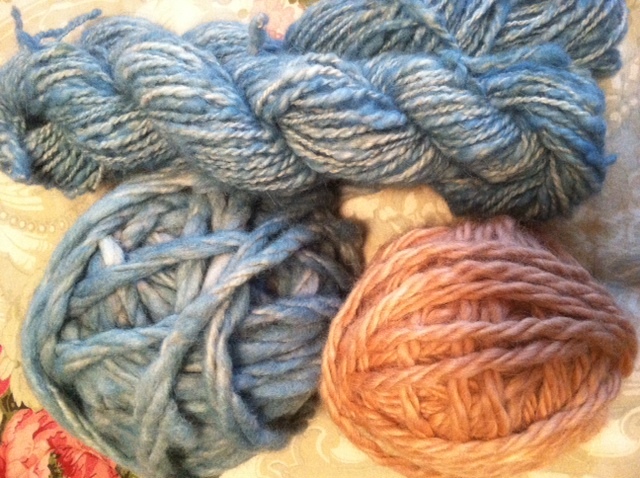 This yarn was dyed naturally with woad from Mom’s garden! I just tried natural dyeing for the first time last week. It was fast, easy and cheap. Why did I wait so long? I started my six woad seedlings (seed purchased from Pinetree) under lights in March. They proved to be indestructible—unconcerned about negligent watering and soil from the backyard. Oh wait! Did I forget to mention that woad is considered a noxious weed in some states? I just hope mine isn’t one of them. Once out in the garden they grew into large rosettes with thick, dark green leaves—again, almost no maintenance. When frost threatened, I prepared my first woad dyebath using the directions in Rita Buchanan’s book, A Dyer’s Garden. I was concerned when I read that my six woad plants would only dye 1oz of yarn! But I chose to disregard that information and dyed over a pound of yarn a nice powder blue if I do say so. I also boiled the leaves a second time for a dusty rose color. The directions for dyeing with woad require a couple of tablespoons of Spectralite which I had trouble finding until someone told me it is better known as thiorea dioxide, a staple in dye supply shops. I’m definitely doing the woad thing next year but may just start the seeds in the garden as they are quite feisty. Previous articleThe Joy of Finishing!